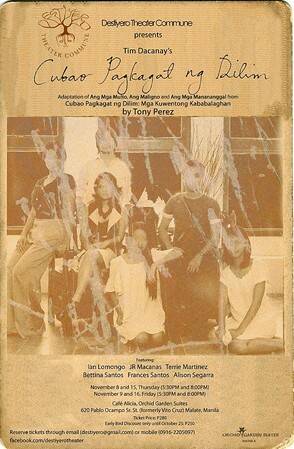 Destiyero Theater Commune presents Cubao Pagkagat ng Dilim, Tim Dacanay's adaptation of "Ang Mga Multo," "Ang Maligno," and "Ang Mga Manananggal" from Tony Perez' book Cubao Pagkagat ng Dilim: Mga Kuwentong Kababalaghan. In Ang Mga Multo, the life of a happily married couple is disturbed when their antique chairs begin whispering in Ilokano. In Ang Maligno, a woman who has resisted letting someone into her life suddenly finds a man on the street, observing her in her apartment. Finally, in Ang Mga Manananggal, a B.S. Biology student’s curiosity over the Manayon Sisters turns into obsession even as he has full knowledge of their sinister secret. DESTIYERO THEATER COMMUNE is founded and initiated by a core group of young professionals in various fields such as the arts, academe, business, advertising and financial institutions who are brought together and bound by theater. In 2009, the group has inherited the name Dulaang Laksambayanan, Inc. and has since staged performances and readings in various venues (from bars to old houses) and theaters. In 2012, the core group has turned over Dulaang Laksambayanan, Inc. back to its founders, and reestablished and renamed itself as Destiyero Theater Commune. To adapt to the conditions of the present time, the commune acknowledges the dynamics of theater practitioners and enthusiasts and explores possibilities to work around it. It envisions a healthy exchange of practices and ideas among collaborators. At the same time, the commune is determined to uphold the essence of inquiry and self-reflection and wish to encourage this value to its audience. It aims to maintain its projects as geared towards the development of critical thinking and aesthetic sensibility or responsiveness. It aspires to present thought-provoking works which will provide new affects that may lead to a reevaluation of held belief systems and ideas. The November 8 (5:30PM & 8:00PM) and November 9 (5:30PM) shows are fully booked. Tickets are still available for the remaining 5 shows: November 9 (8:00PM), November 15 and 16 (5:30PM & 8:00PM) . Venue is at Cafe Alicia, Orchid Garden Suites, 620 Pablo Ocampo Sr. St. (formerly Vito Cruz) Malate, Manila, just in front of Century Park Hotel. Tickets are at P280, with a special early bird promo at P250. For ticket reservation or other inquiries, contact us through email (destiyero@gmail.com) or mobile +63.916.2205097.